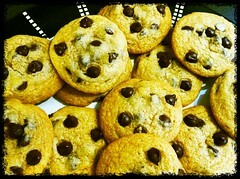 We have many flavors: Chocolate Chip, Chocolate Chip with Walnuts, Macadamia Nut, Oatmeal Rasin, Sugar, and Peanut Butter. Coming Mid Summer we will be offering decorated rolled cookies for all your special events....Baby shower, Wedding, Birthday and Just because themes. There is a minimum 3 dozen per flavor Average cost is $10.00 and up per dozen. All cookies are made to order within 24 hours of delivery. Just as with our cakes we use the best ingredients.